Online Safeguarding – who is responsible? Another day, another online data leak. Yes we know, we really shouldn’t expect online storage to stay private any more… We are working hard to educate children, parents and the community. 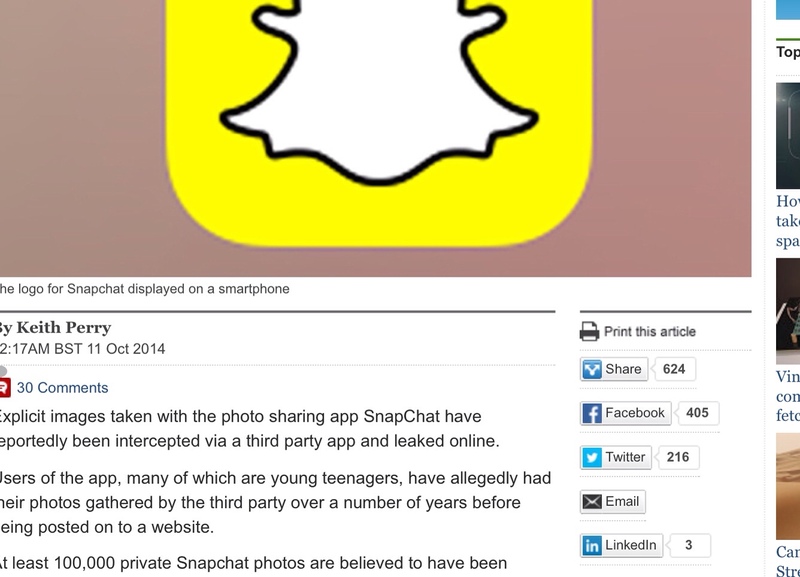 However Snapchat’s leak caught my eye because of one of the ‘facts’ that went with it. It said that around half of the users were under 17, sites seem to differ on the precise number but they all seem to agree that around half of the users are under 18. Therefore, for the purpose of child protection, and safeguarding they are children, vulnerable. Think about that, this company knows that half of it’s users are under 18. It has recently been valued at over $10 million based on it’s potentially lucrative user base. What then does it have to do as part of it’s responsibilty to these children? I know what schools have to do, what youth groups have to do; the training; the form filling in; the checks. I also know what would happen if schools managed to leak data at the rate at which these companies do – and it would not be okay to say ‘but we told them not to use so and so…’. What then do these companies have to do? It seems, nothing – it seems that it’s okay for a company to make a huge amount of money from children, and have no corporate responsibility to those children. We must do something about this. There must be a way that we can force these companies to take some responsibility for their ‘customers’. A look around the internet and you find several examples of Snapchat in particular being warned about leaks and possible security issues. Facebook had similar issues, thought it is impossible to find out from any of these sites if they have any policy at all to the teenagers and children which use their sites. Maybe the answer is fines, responsibility for the leaks. Maybe it is statutory guidance and training, and a names safeguarding laision officer. Perhaps they’d find a way to ensure all users were over 18 if legal action accompanies it. Maybe it is impossible without some sort of international guidance, but you cannot deny that these corporations are letting this happen, profitting from it and then walking away from it with no accountability at all. I really think we will look back on this era of child exploitative social media in horror. Posted by RS on October 11, 2014 in Blog, social media and tagged e-safety, social media, ukedchat.